The TTABlog®: Precedential No. 15: TTAB Again Affirms Genericness of "HOTELS.COM" for ... Guess What? It's déjà vu all over again! [Oops, I said that yesterday.] Anyway, the Board again has affirmed a genericness refusal of HOTELS.COM for "providing information for others about temporary lodging; travel agency services, namely, making reservations and bookings for temporary lodging for others by means of telephone and the global computer network." Applicant submitted new survey evidence in an attempt to overcome the prior ruling, but the Board found the survey fatally flawed. In re Hotels.com, L.P., 87 USPQ2d 1100 (TTAB 2008) [precedential]. In a September 2006 decision, the Board affirmed a requirement that this Applicant disclaim the term HOTELS.COM in connection with the word-and-design mark shown above, on the ground that the term is generic. (TTABlogged here). Examining Attorney Tarah Hardy Ludlow argued that because the same phrase or term HOTELS.COM and the same services are involved here, res judicata bars Applicant from re-litigating the issue. "Under the circumstances, and in an exercise of caution, we find that the survey evidence constitutes a change in facts sufficient to avoid application of the doctrine of res judicata and to justify re-examining applicant's claim that the term HOTELS.COM is not generic." Applicant's survey was a "national blind telephone survey" using a "Teflon" format. 76% of the respondents answered that HOTELS.COM is a brand name. The Board found, however, that the survey was "so seriously flawed that the results cannot be given any weight." First, "there was a critical omission in the screening process" and therefore "the universe for the survey is fatally overbroad." Applicant's expert "should have ascertained through the screening process, rather than assumed, that participants in the survey could distinguish" between a domain name and a brand name, and those who could not should have been eliminated. Respondents also "should have been presented with sample names that had some relevance to the mark in this case." 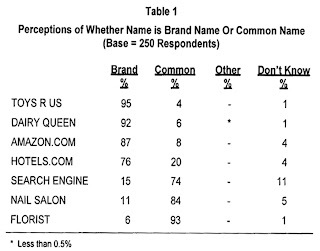 The sample names had "no connection to the type of mark at issue," except for AMAZON.COM, and that name "is too obvious an example of a '.com' domain name that also functions as a brand name." Finally, when the various names were listed, there is no indication "of whether or how frequently the HOTELS.Com mark was immediately preceded by the well recognized example of a '.com' brand name, AMAZON.COM." In light of these deficiencies, the survey was entitled to no probative weight as to the public perception of HOTELS.COM." The Board reviewed again the evidence that it had considered in the prior decision, and found that Applicant had still failed to raise sufficient doubt to overcome the PTO's case. They would have gotten the "trademark protections.